Nacional 27 is the perfect place to dine, drink and dance with your Valentine. Chef Chico Vilchez has created a “Feliz dia de San Valentin” prix fixe menu, available on Friday, February 14 from 5-6:30 p.m. ($40 per guest) and from 7-10 p.m. ($75 per guest). The menu, outlined below, includes shared starting courses and tapas, choice of entree and dessert duo. The later seating includes a champagne toast. Following dinner service, DJ Konsept will spin lusty Latin beats ’til 2 a.m.
Valentine’s Day celebrants may also choose to enjoy the special prix fixe menu on Thursday, February 13 from 5:30-9:30 p.m ($75 per guest). 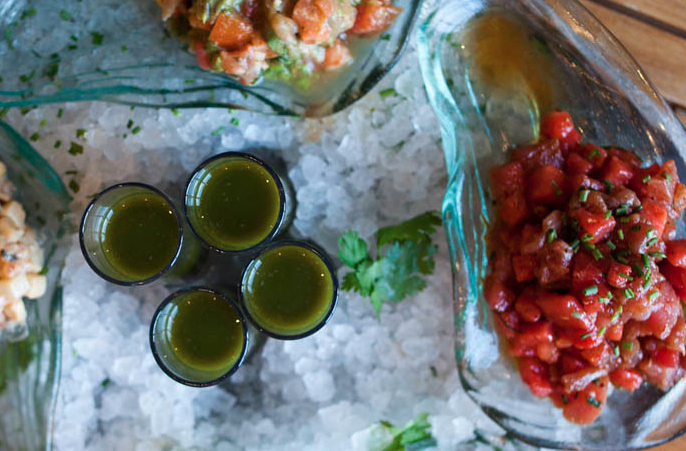 Pre- or post-meal, partake in complimentary salsa dance lessons at 7:30 p.m.
Reservations may be made by calling Nacional 27 at 312.664.2727 or by visiting N27Chicago.com.